You know (or you do not, but then you will know it as from now on) that I do have a (not that secret) appreciation for Belgian label Immortal Frost Productions, run by Ars Veneficium’s chanteur S. It’s the qualitative result for each release that impresses me a lot. Last year, for example, the label did release a split (on vinyl) in between Ars Veneficium and Finnish horde Azaghal (review for that split, which was called The Will, The Power, The Goat, posted on December 24th 2015). The very same label recently also released another split with Azaghal (this time on CD), in co-operation with Oath, hailing from Finland as well. It comes in an edition of 500 copies, with somewhat sober yet extremely attractive artwork done, once again, by Moornebheym. 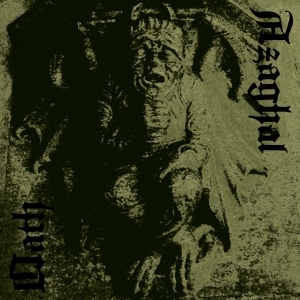 This untitled split consists of five tracks only (three by Azaghal, two by Oath), yet it clocks almost fifty minutes. Opener Nukkuja (which clocks ten minutes) typifies the sound of this band, being mainly fast, powerful and melodic, supported by the heaviest rhythm section (mind the rumbling bass drums! ), epic melodies and sulphur vocals. But I think the band did somehow progress when talking about the technical execution. Still the major part is based on the traditional patterns of old, but there’s something in the guitar sound that strikes me a lot, a certain dissonant wah-buzz (indeed, this word does not exist – until now). Further on it comes with just sublime changes in texture / structure, fabulous riffing patterns and memorable leads. Vedenpaisumus (9:37) is much slower, more pushing and pulling, yet at least as intense and heavy as the opening track, and more in the vein of last year’s split. Here too the technically-skilled progression is remarkable within some leads and riffs, as well as the skilled equilibrium in between the different yet cohesive chapters. I would have preferred to hear the bass parts little more on the foreground, but it’s not that they do absent either. Oh yes, that ending riff, so mesmerizing and cold… Azaghal’s part ends with the shorter piece (4:35) Laivaankairaaja, an eruptional assault in the vein of Sweden’s finest like Marduk, Setherial and Dark Funeral, if you want to, yet with a monstrous sound that also caresses the border with Deathspell Omega and the likes! Both other compositions, clocking twelve and eleven minutes respectively, were created by the duo Oath, which is V-Khaoz (drums and keyboards) and Grim666 (guitars, bass, vocals). Both of them are quite notorious names within the Finnish scene. They did release their debut full length Saatanan Myrsky Yllä Pyhän Maan in 2014 via, evidently, Immortal Frost Productions (for the review, check out the update on July 21st 2014). Of course the stuff was recorded at Grim666’s Patologian Laboratorio Studio (before I forget it: make sure you check out the reviews I did for the releases on his Patologian Laboratorio Productions-label; enter this name in the ‘search’-function…). Oath’s differs a lot from Azaghal’s, for being much more rooted in ‘atmosphere’. The stuff too is intense and fast, yet less technical and complex. As a matter of fact, these melodious compositions are long-stretched, somewhat repetitive and primal pieces, with a sound that isn’t as ‘professional’ as the one from Azaghal. Oath focus on grimness and obscurity rather than aggression and power. The dense, muddy riffs and simplistic yet intensively-hammering rhythm section are nicely supported by floating keyboard lines and raspy, ‘hollow’ voices, the latter giving an occult and mysterious touch. Sometimes, the keyboards take over the lead, and those parts create an atmosphere so magic… It might be a shame that the production is beneath acceptance, for the mix in between the different instruments has not been proportioned the right way. Especially in contrast with Azaghal’s effort, this might be quite a disappointment. But from musical point of view, Oath are truly fabulous. Especially the opening track The King gives me a feeling of hateful and, at the same time, depressing emotions. Evernight then again is much more ‘evil’ in performance, once again sort of combining both external and inner hatred. The buzzing guitar melodies have something epic, especially within the main leads. This split consists of two bands from Finland, yet quite different in nature. However, despite the other approach, I am sure you might adore both of them. There is no need not to… I do like Azaghal for their timeless-sounding fierceness and technical capabilities, and Oath for their magnificent atmosphere and primitive strength. Both are winners (oops, this isn’t a competition)!